Childhood trauma — often stemming from adverse experiences such as abuse, neglect, and household and community dysfunction — impacts just about every domain in which children function and inhibits their ability to learn and develop. 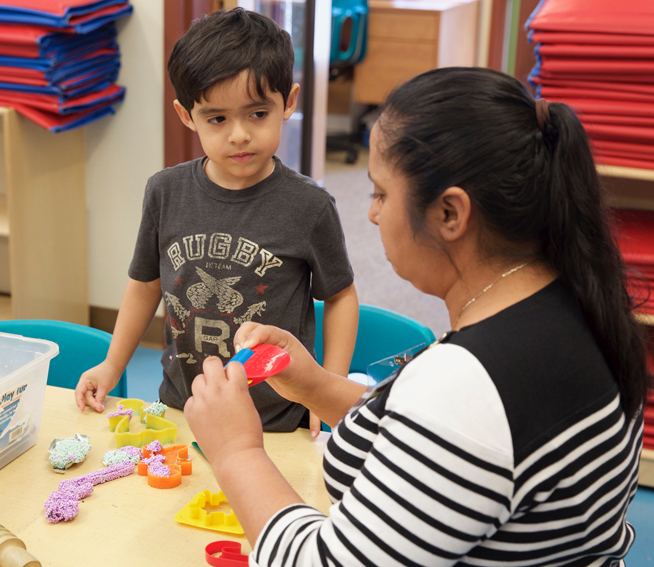 To learn how child-serving professionals are translating the research of stress and trauma into practice and policy, WestEd staff interviewed dozens of researchers and practitioners in the fields of early childhood and K–12 education, health, mental health, and social services. Findings from these interviews were shared in the recently released brief, Trauma-Informed Practices from Prenatal to Young Adulthood: Voices from the Field. To discuss some of the key takeaways from this publication, we sat down with lead author Natalie Walrond, Director of Cross-Sector Initiatives at WestEd. The following is part one of a two-part Q&A. Question: You interviewed practitioners and professionals from several different fields —were there any common themes that came up across the interviews? Natalie: We noticed that regardless of the demographics of the children being served or the professional discipline of the people we were interviewing, trauma was impacting some portion of the children in their care. Sometimes they knew about the child’s trauma, or even had a specific diagnosis, and sometimes they didn’t know about the child’s history with trauma. So, the first big idea we came to was that all practitioners need to ensure that their practice is trauma-informed because it isn’t always possible to know the adversity or the trauma profile of the children in front of you. That means that all practitioners need to have a responsive, relationship-based set of practices to be able to meet the varied needs of every child they serve. We also saw that all educators need to be able to collaborate with other child-serving professionals across disciplines and across sectors. The work can be so much more challenging and isolating if you feel that you are solely and completely responsible for noticing and attending to trauma in children. And it feels so much more possible to serve children well when you can collaborate with colleagues across different disciplines to make sure the child is getting everything that they need. Another common theme we saw was that practitioners need to make sure they have support for themselves to manage their own compassion fatigue or secondary trauma. Childhood trauma is common, so a lot of teachers and child caregivers have their own personal experiences with adversity and childhood trauma. Further, early childhood practitioners are severely underpaid. It’s not uncommon for them to experience food insecurity or housing insecurity, and when faced with a child who is experiencing trauma because of those issues, it can be profoundly painful. So system and organization leaders need to be particularly attentive to making sure that their practitioners are getting supports for themselves. Can you talk a little about how the practitioners you spoke with were noticing and attending to the effects of trauma on children? By contrast, some children with trauma may “act out,” and teachers may mistake it as ADHD or aggression. Certainly, not every child who withdraws or exhibits challenging behavior has trauma. So the challenge for the adult is to look for the root cause of the behavior, and ask what’s happened to the child. And then the second step relates to how you respond to trauma. Trauma-informed practices put the relationship between the adult and the child at the center. Fundamentally, a child with trauma needs to know that he or she is with an adult who is reliable, consistent, trustworthy, and cares for them. Were there any particularly compelling approaches to trauma-informed practice — either at schools or other organizations — that stood out to you? One of the organizations that we highlighted is HEARTS [Healthy Environments and Response to Trauma in Schools], which started out of the University of California at San Francisco. They’ve been doing a lot of work in San Francisco Unified. HEARTS is not a program that’s prescriptive, it’s much more about helping the adults in schools understand how to adapt their strategies and behaviors in ways that help the children that they’re serving. It’s guided by a set of core principles that are about equity, cultural humility, and treating colleagues and children with respect and compassion. Stay tuned: In part two of this Q&A, Natalie Walrond reveals some unexpected insights and key takeaways about trauma-informed practices.